This very finely constructed amphora has a sharply tapering form, with a pair of strap handles arched from the sides of the scooped and flared rim to the high shoulder, raised on a flat base. The curvy mouth of such amphora is known in China as 'saddle-shaped' and is the most characteristic feature of amphora from the Siwa culture developed in the present day Gansu province. The Siwa culture was contemporary to the second part of the Shang dynasty, dating from the 14th to 11th centuries. 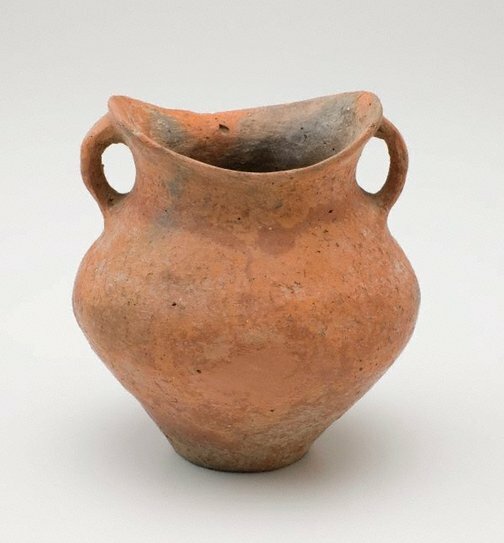 Pottery jars from the Siwa culture are rarer than those of the preceding late Neolithic Qijia and Majiayao cultures also from Gansu province, and most known examples are made from an orange coloured pottery. The surface is finely burnished making this jar a real pleasure to handle as well as to look at.